For me, I suppose that quote could be altered to, I can never have enough of winter wildlife in eastern North Carolina. Okay, not as poetic for sure, but true nonetheless. 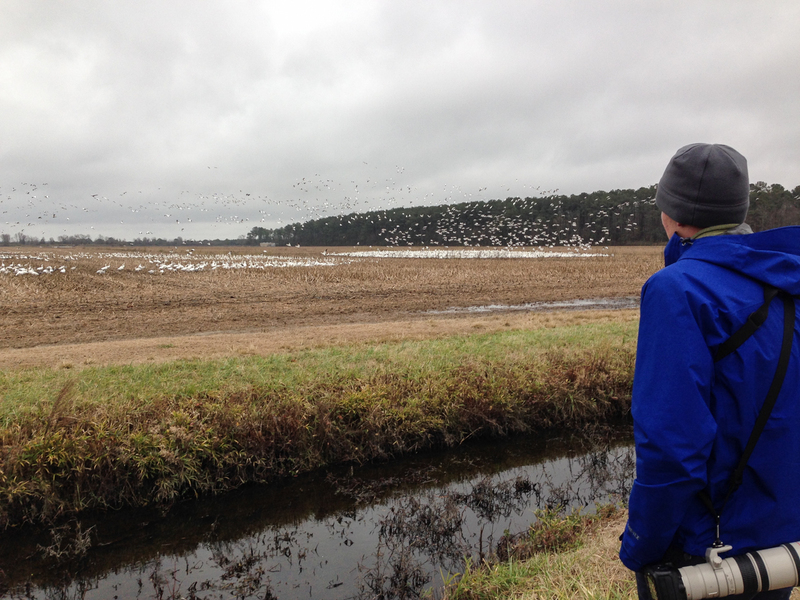 Why else would I (and 6 other bird nerds and friends) spend all day out in the brutally cold wind and mud at Pocosin Lakes National Wildlife Refuge? Well, another reason is that we were one team participating in the annual ritual known as the Pettigrew State Park Christmas Bird Count. I helped start this particular bird count about 30 years ago when I worked for the state park system and I have managed to attend almost every one since. This year is the 115th for the National Audubon Society Christmas Bird Counts. The concept was born in 1900 when Frank Chapman, a noted ornithologist, and 26 other people went out and counted birds in 25 locations, mainly in the northeast United States. The idea was to offer an alternative to the practice of Christmas “side” hunts practiced at the time, where people would go out on Christmas Day and shoot as many birds (and often other wildlife) as they could, whether they had a use for them or not. Conservationists were concerned about this, and other practices, and the general decline in bird species, and thought the counts would be a good way to bring attention to the plight of birds. From those humble beginnings, the Christmas Bird Counts are now the longest-running citizen science program, with over 71,000 people participating in over 2,300 count circles in the Western Hemisphere. Data from these counts provides scientists with all sorts of useful information on population trends, range expansions over time, and other information on a wide range of bird species. Participants try to identify and count all the birds within a chosen 15-mile diameter circle on a assigned day during the period from December 14 to January 5 each year. The Pettigrew Count is centered on the state park and includes surrounding farmlands and forests as well as a portion of the Pungo Unit of Pocosin Lakes NWR. Teams of volunteers go out before dawn and bird their portion of the count circle all day, keeping track of everything they see and can identify by sound. Obviously, we do not record every single bird that is actually in the count circle that day (especially in areas like the refuge, where portions are closed to public entry to protect the wildlife from disturbance), and there are challenges with estimating the numbers of large flocks, and in trying to not to count birds more than once. But, one of the benefits of having some of the same people do the count each year is that the results will be somewhat consistent, enough that trends in the data over time can be seen. This year, our team consisted of three beginning birders, two experienced birders that had been on this count many times, and two young, enthusiastic, and knowledgeable birders that had never been on this particular count. 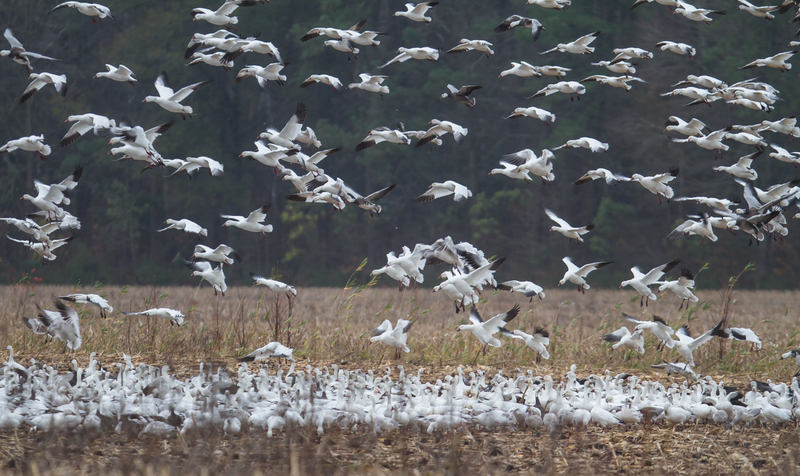 One of our highlights on this count is the huge numbers of Snow Geese that roost on Pungo Lake and feed in nearby farm fields. The birds have been a little less predictable the past couple of years and they continued that trend this year, with the huge flock breaking up into smaller flocks and dispersing in varied directions during the day. We did find a flock of a couple of thousand feeding in the fields near the refuge entrance, and then began the sometimes long process of trying to pick out some Ross’s Geese from the flock. Ross’s Geese look like miniature Snow Geese, and can be tough to spot when there are thousands of their look-alike cousins in a field. But, with the gusty winds holding the birds up in the air longer as they landed and slowing down their flight, we were able to spot many of the smaller Ross’s Geese in in the air, and, in fact, got our highest number ever (23) for this portion of the count circle. Other highlights included the first Cackling Geese (look like small Canada Geese) we have ever recorded on this portion of the count and an immature Mute Swan. The latter has been hanging out in one of the impoundments at Pungo for a few weeks. 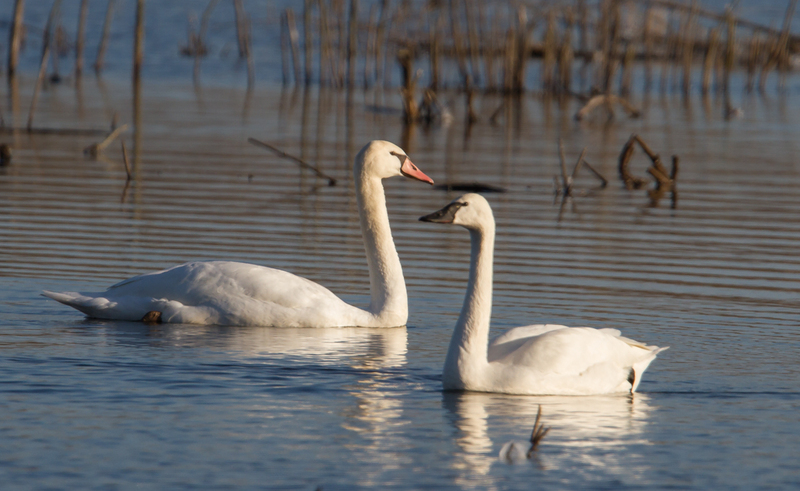 It is much larger than the usual Tundra Swans, and immature birds have a pink bill and lack the large knob on the bill that is diagnostic of adult Mute Swans. At first, I really wanted to make this bird an immature Trumpeter Swan, but I guess I will have to go with the consensus of it being a Mute. 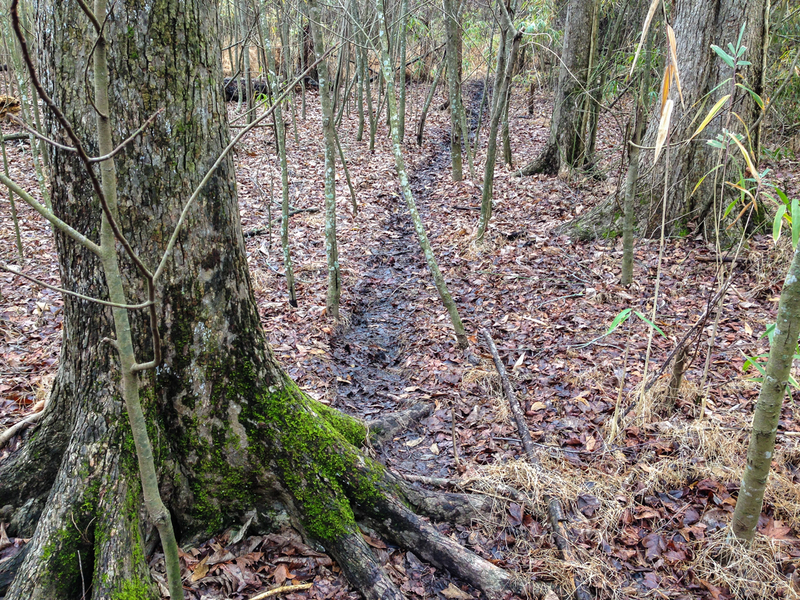 Another highlight was walking through the woods looking for mixed species flocks, and traveling through the underbrush on a well-used bear trail. We did see seven bears along that trail, including two resting high up in trees (always a thrill to see). Added to those non-bird sightings were soaring Bald Eagles, a Cooper’s Hawk dive bombing some robins and a Wood Duck, the flash of a Merlin as it streaked overhead, and tens of thousands of Snow Geese coming into the lake at sunset, and you can see why the day was memorable, in spite of the bitter cold. One of the most memorable moments was when I asked the young birders (and these guys are both passionate and skilled) how they first got into birding. They both gave some of the credit to a trip I had helped lead to this very refuge when they were with the museum’s Junior Curator Program. They recalled walking down this same dirt road, seeing bears, and thousands of Snow Geese and Tundra Swans flying over, the vastness of the place, and the amazing sounds, as one of the things that inspired their passion. What a great way to start a new year…and to help me make a resolution to help get more people, especially young people, out into nature to discover their own passion. This entry was posted in Natural History and tagged christmas bird count, pettigrew state park, pocosin lakes national wildlife refuge by roadsendnaturalist. Bookmark the permalink. That is an impressive bird count for one day! I agree that eastern NC is one of the most bountiful and beautiful places for wildlife watching. Tom, the Snow Goose count is now zero I believe. 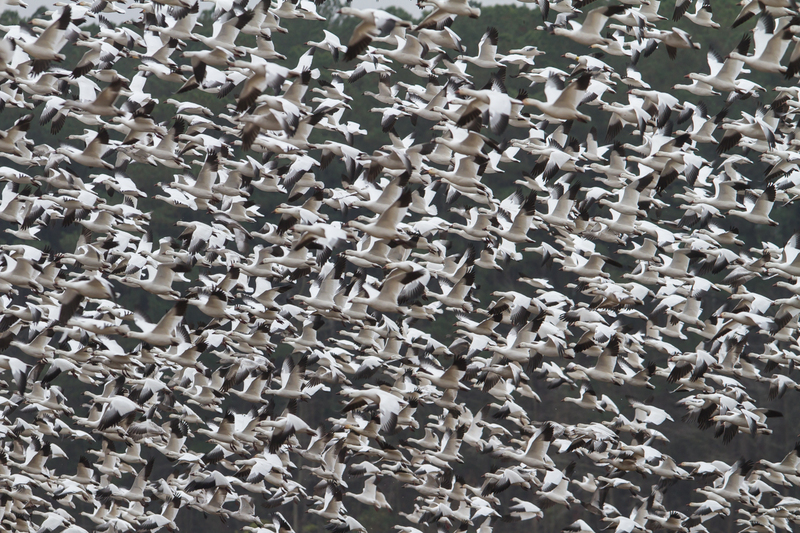 They, and now even the Tundra Swans, have headed north.